On tour now with Panic! At The Disco and Misterwives! Saint Motel is the kind of band that, no matter what, makes you want to dance. The Los Angeles four-piece creates music with the same charisma and energy that they possess onstage, a fact anyone who has seen them live can attest to. Since the success of their 2014 EP, My Type, the band has become known for their inventive visuals and highly entertaining performances. Most recently, the guys have been busy creating mind-blowing VR/360° music videos for tracks off their latest release, Saintmotelevison, an LP they plan on making the first-ever Virtual Reality album. Yes really. To promote their latest project, the group–A/J Jackson (lead vocals, guitar, piano), Aaron Sharp (lead guitar), Dak Lerdamornpong (bass), and Greg Erwin (drums)–are currently on tour with Panic! at the Disco and Misterwives. We had the chance to chat with Jackson the night after all three bands performed at Madison Square Garden about everything from their pre-show rituals to what they wear onstage. 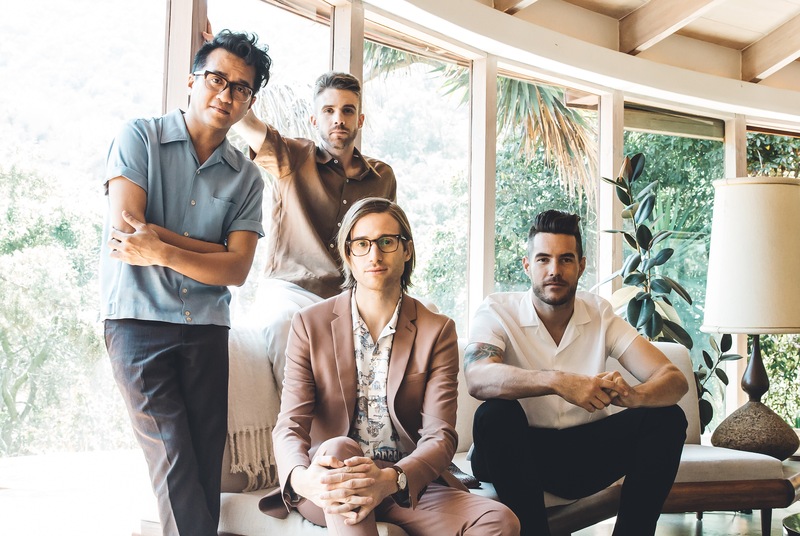 Check out the interview below, and don’t forget to track Saint Motel on Bandsintown so you don’t miss them in your city. So, I just want to start off by asking you how playing Madison Square Garden was last night? Oh man, that was rad. We’ve never been there, like, even inside to see a game or to play the smaller venue there, so it was completely a new experience for us. Inside, was...I don’t know, just really beautiful. It felt less sports arena—it was more symmetrical, it was designed in a way that looked a little bit more artistic. And of course, it’s just so legendary, you just get excited. I know it’s early in the tour with Panic! and Misterwives, but what’s the biggest difference from playing in a small venue, versus playing in arenas like that? With these big arenas, it’s similar to playing a nighttime festival. In a club, you see everyone’s eyes, you’re in it, you feel their sweat, you’re all dancing together, you can jump and mosh if you want to or crowdsurf. In an arena, you’re pretty removed so you see everything on a scale of epicness, which is a bit different. They definitely both have their own merit. Arenas are new for us–we’re lovin’ it. How do you generally pack for a tour like this? We went from our headlining run directly to Panic! here—we had to plan for almost three months. My luggage was lost by the airline day-one in Europe and I was like “Sh*t” (laughs), but they found it so I was only without it for like a day. I just was thinking when that happened how important it is—just your clothing and your luggage—to make a tour work. That red suit I wore on the Today Show and at Madison Square Garden, I got at our last show in Italy about two weeks ago from a friend. We keep accumulating things as we go from city to city to the point where we can’t even fit it in the bus, so you might go back home with completely different stuff than what you started with. Do you have any must-have items? A lot of us use Peter Nappi Boots from Nashville that just can take an extreme beating and survive—that’s really important, especially with all the jumping and dancing and sliding and stuff that we do. Do you have a favorite venue or city in Europe? Some of our favorite cities are probably Amsterdam, Edinburgh, Venice. We had a day off in Strasbourg on this past tour, which we had never been to and that was incredible. I was surprised, like, “Oh! We have a day off?! Oh, where are we?! Oh, this is cool!” I was in constant amazement that day. We played Brussels for the first time, which was really cool—that one was at a really interesting venue. We played in Munich, it was in an old water/power factory, which was really interesting. Every city you go to has some perks, like whenever we play Paris, you just walk out of the venue and to your immediate left or right is a great cafe. You never have to go far to get good food by any venue in France. And Germany is like, after the show, you can stay out all night, doing crazy things. I think they all have their own perks. We still have a lot of exploring to do, a lot of cities we still haven’t played yet! Saintmotelevision is an extremely catchy and infectious album. Which of the new songs have been your favorite to play? Was it hard for you guys to narrow down a setlist for the current tour? It was! We went from like an hour and twenty minutes–to thirty minutes, so we had to kick off a lot of our children from the setlist. Songs like “Sweet Talk”, when the crowd is singing along are really fun, and that kind of became a moment. “Move” is really fun—it feels huge with everyone shouting with us. And then “For Elise” has a really beautiful moment towards the end–it breaks down and gets really, really minimal, which is always one of our favorite parts. I have this TV on wheels that holds my keyboard, that has timed-out visuals for every song. We did that initially because we started touring this fall, before the album came out, so there’s no way people could have known the songs. Having those lyrics onscreen helped people know what’s going on, so they can catch on really quickly. Do you guys have any pre-show rituals? How do you typically prepare? We do. About two hours before showtime is when we start getting ready. Some of us meditate, stretch, or whatever. About an hour before showtime is when we start putting on loud music. Aaron, the guitarist, calls it “techno warmup,” so he puts on really loud music and everyone kind of starts dancing backstage. We do something which I think we made up, which is, just a series of slapping each other...just to kind of get the blood flowing (laughs)—if you walk into our green room before the show, you’ll probably see us all just hitting each other. Then my vocal warmups—a lot of them are cereal jingles. So you’ll hear a lot of like, “COOOOkie crisp” and “They’re gRRRReat!”—I pretty much do that every night. And then we have secret thing we do right before we go onstage, which I can’t talk about. What was the first concert you ever went to and what do you remember about it? I’m from Minneapolis and First Avenue is our historic venue downtown where Prince Purple Rain. I remember going there in preschool with my mom, seeing some metal band sound-checking and the lead singer was wearing tiger Spandex pants. I don’t know who it was, but, I was like four or five or how old you are in preschool...maybe three? (laughs). I remember winning tickets later to see Rancid at First Avenue when I was in high school. I called in to win tickets, I couldn’t drive or anything, so I went with my sister’s older friend, who had a car and that was fun. If you could give a new band that’s just starting out any advice for live shows, what would you tell them? I think we’re kind of a different band in that sense because we definitely take the hard road with a lot of these things, like building a TV/keyboard stand, making our own lights from Home Depot with extension cords and Christmas lights...We’ve always done things without many resources to make the show more fun. It’s also a lot of work, you probably will get electrocuted a couple times, so I don’t know if I’d give the advice to make it crazy all of the time. I would say get to know your band members enough to the point of “Do they want to do that?” You’re probably best off being a DJ, just bring a laptop—don’t even worry about amps anymore, they’re a pain in the a**. Or! Be an a capella group...that’s my advice! You guys are performing at quite a few festivals this summer, like Gov Ball and Shaky Knees. What are you looking forward to most about those gigs and are there any artists you’re looking forward to seeing? Yes. It’s pretty fun to do these festivals because you get to run into all these bands that you haven’t seen in such a long time. It’s kind of like band summer camp–that’s always one of my favorite parts about it. I’m really excited to see Phoenix. I’m not sure which days we’re playing and how it connects, but really excited. I hope we see Pixies and Dr. Dog is always amazing—The Shins are rad, too!